What Is Kiwano, aka Horned Melon? What Does Horned Melon Taste Like? The kiwano is indeed a fascinating little piece of fruit. Yes, it’s a fruit, not a vegetable. The spiky, yellow/orange skin of kiwano melons will immediately grab your attention. And when you cut them open, the soft and bright green flesh may surprise you even more. The fruit is actually native to southern and central Africa, but has also been grown in New Zealand, Australia and parts of the USA in recent times. As you can see in the image below, the inside of this fruit looks very similar to the inside of a cucumber. But the outside looks more like a spiky melon. Kiwano – cucumber, melon, or both? 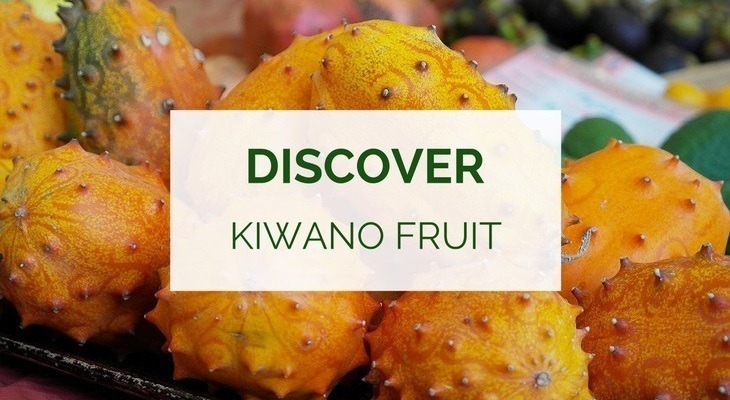 So what is kiwano? A cucumber, a melon, or both? It seems this fruit is struggling with an identity crisis, but the kiwano is officially a member of the melon family as well as of the cucumber family. The inside of the fruit is interesting. You’ll notice that it’s full of seeds, and these seeds are actually edible. The texture around the seeds is like a green jelly, which may taste kind of weird the first time you eat it. So what does horned melon taste like? The general opinion is that it tastes like a mix of cucumber, zucchini, kiwifruit and banana. I would say that’s about right, but I would like to add cantaloupe into the mix. I also found that the taste in general is not very sharp or sweet, it’s kind of neutral. This is good in a way, as it won’t be too much of a shock when you eat it for the first time. When it’s very ripe though, the banana flavors will start taking over control. The kiwano goes by many other names, depending on where you are. 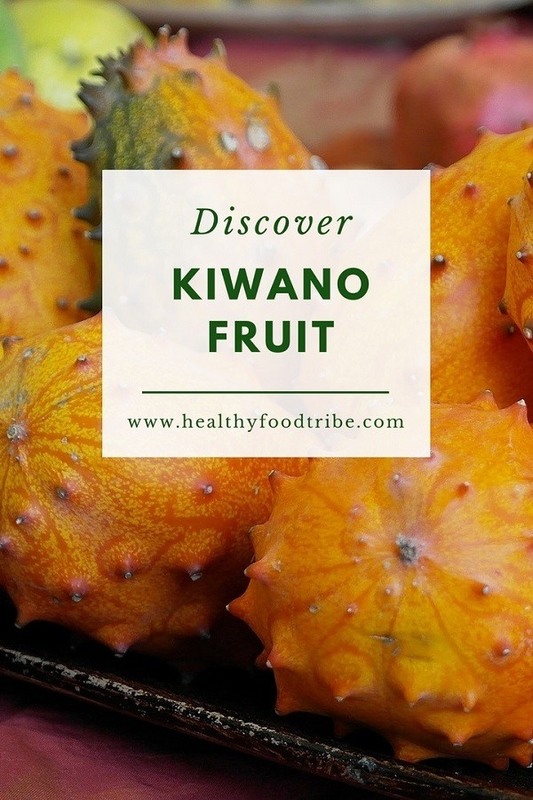 The weird looks of this fruit and with the characteristics of cucumber and melon mixed together, it should be no surprise that the kiwano melon has been given many exciting names. The scientific name for the kiwano fruit is Cucumis Metuliferus. Cucumis is a a reference to the cucumber and melon family, while metuliferus is a Latin word that refers to the spikes on the fruit. Kiwano is also known as African horned melon, jelly melon, African horned cucumber, melano, and they have even been called spiked pears. So if you’re on the hunt for a kiwano melon and you see any of these names, then you’ve probably found the right fruit. Cutting and eating a horned melon is easy, but to make the most of it, the following tips may come in handy. The first thing you should do is make sure you choose a ripe kiwano. A ripe one typically is not too hard (and not too soft either) and has an orange color rather than yellow or green. Also, make sure you properly wash the fruit before cutting to avoid getting your knife dirty or contaminated. You can “drink” a kiwano melon by cutting it in half and then squeeze the contents of one half into your mouth. The seeds can also be consumed so you can basically drink everything that you can squeeze out of the fruit. However, the more common way to eat this fruit is to cut it in half and then scoop out bits and pieces with a spoon. Do the cutting and scooping on a clean cutting board so you can also eat the left-overs that you may spill. The seeds and jelly-like flesh of kiwano melons are excellent ingredients for fruit salads. The juice also does very well in cocktails. You’ll have your guests wondering what’s in their drinks! And of course, kiwano melons can easily be added to green smoothies as well. That’s what I’ve done many times to add extra flavors to my smoothies. But to be honest, because they are so unique and also a bit pricey, I prefer to simply eat a kiwano melon by itself. That way I can best enjoy its unique flavors. Oh, and don’t just throw the shells out. You can use the hollow shells as a fun way to serve desserts! Kiwano melon has quite a rich nutritional profile boasting a variety of nutrients, vitamins and minerals. Let’s have a look at the most important and most abundant nutrients that exist in kiwano melons. As you can see, a kiwano melon is very watery, is very low in calories and is rich in a lot of vitamins and minerals, such as potassium, magnesium and vitamins A and C.
Also worth noting is the relatively high protein content. This is because the kiwano has lots of protein-rich seeds. Just like with most fruits, kiwano melon is rich in antioxidants, for example through Vitamin A with carotenoids and beta-carotene, and vitamin C.
Antioxidants are crucial for our health, protecting our bodies against cell damage caused by free radicals. It will help prevent disease and slow down the aging process. Vitamin A is also good for the eyes. Horned melon – spiky fruit! Magnesium is also a very important mineral, used by almost every single organ in our body, especially our heart and kidneys. And calcium promotes good bone health and will help prevent conditions such as osteoporosis. Although the kiwano fruit is indeed a very healthy food, high in important nutrients, it’s certainly not the most nutrient-dense type of fruit out there. Kiwifruit for example is richer in nutrients, especially vitamin C and calcium. But that doesn’t take away the fact that the kiwano fruit is a very tasty alternative to the usual fruits we eat every day. A delicious and unique recipe for a sauce to go with beef. The sauce is made with kiwano pulp, lime juice, green onion, cumin and garlic, mixed together in a blender or food processor. Once blended into a nice and creamy texture, the sauce can be spooned evenly over grilled lean beef, lettuce and cucumber. You can find this delicious recipe on Food Network. We all love a refreshing sorbet, especially on a warm summer’s day, but have you ever thought of kiwano sorbet? This delicious recipe over at Peaceful Dumpling is definitely worth a try. It’s a rather simple recipe with 1 kiwano fruit, 2 bananas, 1 apple, coconut sugar and water. You will need a decent blender to process it all into one super tasty and nutritious sorbet. Unfortunately it can be quite challenging to find horned melons. But I do encourage you to keep an eye out for them, especially at big fruit markets or specialty grocery stores. The unique taste and texture of kiwano fruit should be enough reason to try it out at least once. And not to mention the health benefits! Because the kiwano is not always readily available, the price tag can be somewhat hefty. But if you do succeed to find and buy one, I would love to hear your thoughts. Do you love exotic fruits as much as I do and would like to see more? Check out my list of 20 exotic fruits that you should try at least once in your life! Thanks for the info on the horned melon! I bought one a week ago at the grocery store because it just looked so funky. Of course, then I wasn’t sure what to do with it. I dove in today and tried half the goopy middle in a smoothie. It has some texture due to the seeds, and a bit of a cucumber vibe, but it’s tasty! Is the Kiwano skin edible? I blended everything together with seeds and skin. Hi Peter, I personally wouldn’t eat the skin, but I couldn’t find any sources that say the skin is toxic so I am guessing it should be fine. Yes you can eat the skin too and you can eat it whilst green. I am growing kiwanos now in Kansas USA. I am originally from Southern Africa. The Kiwano can also be used as a vegetable much like a cucumber, in salads. Just discard the skin. Very nice in summer salads of all varieties. I juiced the thing. Peel and all in my masticating omega juicer. Juice came out sour but tasty. $4 a pop here in Arizona. You are all missing out on the best part! Picked at about 2/3rds full size when the seeds are still soft they make excellent cucumbers. Peel and dice into a salad. I do scoop out and sweeten the ripe fruit, but this can’t begin to compare to their usefulness as a vegetable. After all if you leave normal cucumbers on the vine they turn orange and sour too. They are incredibly productive with one vine covering about 100 square feet and producing 6-8 cucumbers per week when harvested young. They smother any weed in their path. They do not need watering once established and will often plant themselves and produce without any help at all. My personal favorite edible plant hands down. Every week my family has a day where we try something new. Today we bought a dragon fruit and a kiwano horned melon. My children absolutely loved the horned melon! So did my husband and I! The dragon fruit was very delightful too I must say. I refuse to have raised picky eaters. I love the fact that my children will try anything at least once. I tell them all the time you’re not allowed to say you don’t like something if you’ve never put it in your mouth. Thanks Laura, that’s such a great idea to have one day each week to try something new, love it! Thanks so much for your article. I used to eat kiwano fruit a lot when I was in Zimbabwe. Very good. 3$ per piece available in Kenya. Growing wild in Antalya Türkiye. Going to pick one today..
I’m growing some in Magalia, California! (2400′ elevation) seems to be pretty easy to grow, like a climbing melon. Bought one at the grocery store last summer and some seeds ended up in my compost pile and grew out of a garden area where I spread my compost this year. I think I will continue to grows these crazy melons! When he was alive, my father actually grew some and sent them to the markets in Sydney and Melbourne. Used to get between $A 11 and $A 17 for a tray. The market owners used to call him the “Kiwano King”. I wish I had some nice land where no frosts happened… could make a good earning. I live up in Ontario Canada and enjoy growing these in my veggie garden. They grow super fast in my short summer climate. I grew African horned melon vines in my garden in central New Jersey! They climbed up the trellis and were heading for the roof of my garage so I had to cut the top back twice. The vines even tried to get into the garage through a window that had a crack! Had to yank them back out of there twice. I saved seeds from the harvest for future use. Pat’s horned melon juice recipe: scoop out the insides of one fruit, green seeds only not yellow rind. Put it in a glass jar and fill jar with boiling water. I use a 24-oz (710ml) pickle jar. Put the lid on then shake it around several times, let it steep and cool. Put jar in fridge, let steep for several more hours. To make the drink: strain the juice into a tall glass half way, add water so glass is 3/4 filled (to dilute it a little), add honey and splenda to taste, stir, then add ice. It tastes like a green lolly pop (lime) with a slight hint of green banana. Store the unused portion in the jar in the fridge for up to 3 days. I am looking for kiwano fruits here in Connecticut. Anybody knows where I can get some or if I can order from out of state? Any websites? Thank you and I appreciate the information. Hi Kim, I have a small farm in South Africa where I grow kiwano fruits, I can supply for you if you are interested. I can mail them when mine are ready. I have planted them. In my third year growing them in Kansas. I currently have a vine full, prolific fruiter. I am juicing the whole melon semi green with other fruit and yummmmm, very delicious. I can feel an instant hit to my cells. Wow that does sound delicious (and nutritious) indeed, thanks Jane. Tried it today for the first time. Very cool and crisp, like eating a cucumber.. reminded me of eating boba. Would eat it again for its nutrient value. Cost was $5.50 in central California. Glad you liked kiwano fruit, Dori. And boba, that’s an interesting comparison! Over $7 each here in central Texas! Very mild flavor, a bit like a cucumber, a kiwi, and an unripe banana. I probably wouldn’t buy one again at that price, but at least I can say I tried it! Glad you got to try kiwano, Baylee! And yes, $7 is a bit much for a fruit. Hi Donna, my name is Abraham from South Africa, I am currently growing the kiwano fruit and I would like to know if there is a market where I can import them in bulk. Hi Abraham, I don’t have info about importing, but it’s so nice to hear you’re growing kiwano fruits in South Africa! I tried the kiwano horned melon and I love it. I first tried it plain and it was good but when I put it in a smoothie it was delicious. Just harvested 10 kiwano fruits from my garden in Central Texas. The vines grew vigorously. They did take longer to fruit than regular cucumbers. Oh, they love the Texan heat. I plan to deseed them and add them to smoothies or juice them. This is so amazing. But here in South Sudan, no one is growing Kiwano fruits but they grow on their own. I like it more than any other fruit but the challenge is that some of these fruits taste bitter and some have good taste. So I’m planning to plant them and my challenge here is where to get the seeds. Please help me by sending ways on how to get them via my email address, lonoklochile @ gmail dot com.